Heat oven to 425°F. Unroll 1 pie crust on work surface or cutting board; cut into 1/2-inch squares with knife. Lightly beat 1 of the eggs; brush over squares. Set aside. Place second pie crust in 9-inch glass pie plate as directed on box for One-Crust Filled Pie. Arrange squares around edge of crust, slightly overlapping. Brush edge with lightly beaten egg. In medium bowl, mix 1/2 cup of the brown sugar, nuts, the butter and vanilla; spread in crust. In another bowl, beat pumpkin, cream cheese and remaining 2 eggs and 3/4 cup brown sugar with electric mixer on medium speed. Beat in flour, cinnamon, ginger, allspice and nutmeg. Spoon over nut mixture. Bake 15 minutes. Reduce oven temperature to 350°F; bake 30 minutes longer or until set. Cool. 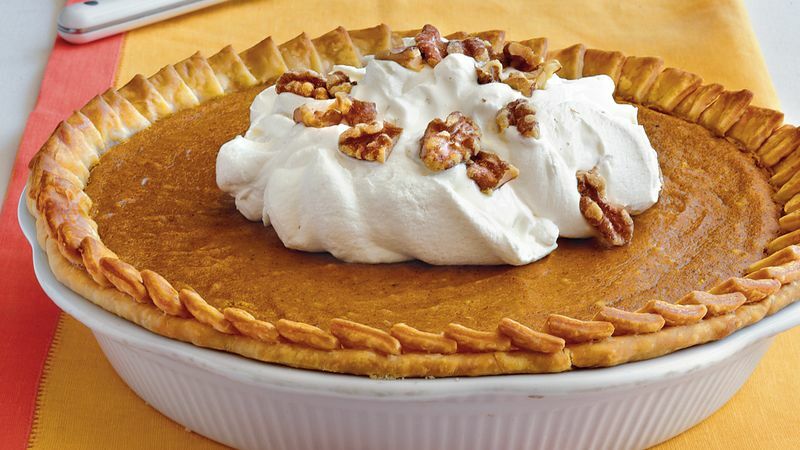 Garnish with whipped cream and additional nuts.